An important update follows this article. 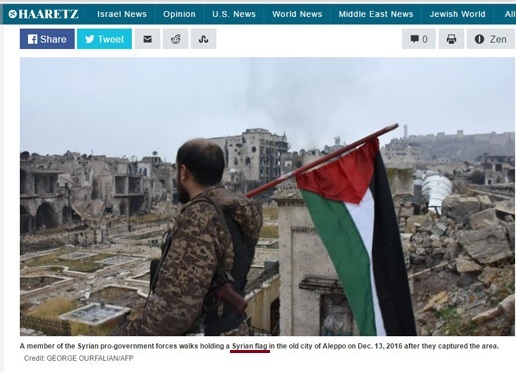 CAMERA’s Israel office today prompts correction of a photo caption in Haaretz‘s English web site which wrongly identified a Palestinian flag in the hands of a pro-Assad regime fighter in Aleppo as Syrian. The caption accompanies a photograph from Agence France Presse. AFP’s caption, as it appears in AFP’s photo archive (screen shot below), correctly* identified the flag as Palestinian. Following communication from CAMERA staff, Haaretz editors promptly corrected the caption. It now correctly identifies the flag as Palestinian. 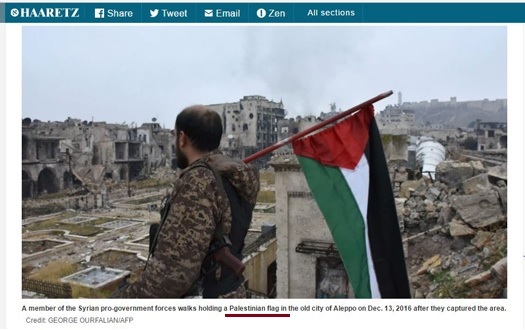 Update: After further examination of AFP’s photo and caption, it appears that the flag is neither a Syrian flag nor even a Palestinian flag, but rather a Baathist flag, which is identical in design and color to the Palestinian flag. Dec. 15 Update: After communication from CAMERA, AFP corrected its caption so that it no longer describes a Palestinian flag.